Starting November 11 regional cellphone carrier C Spire Wireless adds the Apple iPhone 4S to its lineup making it the smallest US carrier to offer the coveted phone. C Spire primarily serves customers in four states including Mississippi, and parts of Florida, Alabama and Tennessee. While C Spire's newest handset offerings may not be news for anyone outside of the company's primary business area, this is a significant move for regional carriers and customers in general. With a customer base of less than one million, C Spire ranks as the eighth largest carrier in the United States. That suggests C Spire will not be the last regional cellular carrier to offer what is arguably the most popular smartphone in the world. Apple's latest iPhone will have the same pricing at C Spire as it does with the three national carriers that carry the iPhone--AT&T, Sprint, and Verizon--$199 (16 GB), $299 (32 GB), and $399 (64GB) with a new two-year contract. The company will also carry the 8GB iPhone 4 for $99 with a new contract. C Spire first announced plans to start selling the iPhone 4S in October. 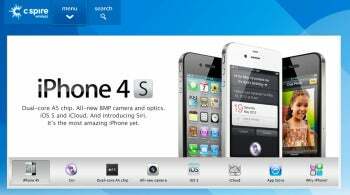 The iPhone 4S on C Spire may also put to rest concerns raised by Congress in 2009 when the Senate Committee on Commerce, Science and Transportation examined how handset exclusivity arrangements affected consumers. At the time, the Rural Cellular Association, an industry lobby group comprised of 100 regional carriers including C Spire, complained that exclusivity arrangements were making it harder for smaller carriers to compete. If more regional carriers can get their hands on the iPhone, it may not only give smartphone buyers more choice, but could also help make smartphone data and voice plans more competitive. C Spire, for example, is offering four packaged plans for the iPhone 4S that include voice calling, unlimited SMS and unlimited data priced between $50 and $100. The only limitation from C Spire is that its two cheapest plans ($50 and $70) don't allow you to stream music or video over your cellular data connection. Compare that to fellow iPhone newcomer Sprint, where you pay about $80 to get 450 voice minutes, unlimited SMS, and unlimited data. A similar plan from C Spire is priced at $50 (minus music and video streaming). AT&T and Verizon charge in the neighborhood of $85 and $90 respecitvely for a similar plan that includes a 2GB limit on data. C Spire's competitive calling and data packages alone won't change much for most smartphone users looking to buy an iPhone. But if more rural and regional carriers can get their hands on the iPhone and offer similar pricing, that could put pressure on all carriers and benefit customers looking for more choice and competition.